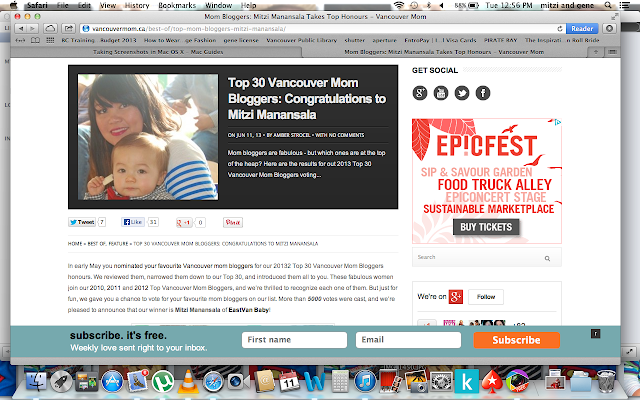 east van baby: Vancouver's Top Mom Blogger?! What the What? Vancouver's Top Mom Blogger?! What the What? Congratulations to the Top 30 fabulous Vancouver Mom Bloggers! Thank you to VancouverMom.ca for annually recognizing amazing women and mothers, as well as exposing resources and sources of support for Lower Mainland parents! "No man is an island." where does 'mitzdemeanor' come from? in my quest to create an internet identity, i just happen to hear Missy 'Misdemeanor' Elliot playing something on the radio and i was inspired. my blog shares bits and pieces of my little family's life through pictures and stories. I'm by no means seasoned enough to give advice on motherhood, but i love sharing my experiences with a light and positive though real perspective. what you see on the blog is never full picture. For safety and privacy, there is plenty of information we don't share and as Max get's older, his role in the blog will also change. Is your blog your full time job? though it may appear i blog quite often, it is something i do for fun part time. i work full time as a palliative care nurse at one of Vancouver's major hospitals (we ease the symptoms of terminally ill patients so they are not suffering). Aside from work, I'm also a mom of a toddler. thats my other full time job (phew)! my husband works seasonally, and is the primary care giver of our son when I'm working and of course full time supporter of myself! I have a Canon Rebel t3i with a 50mm lens that i always shoot with. for when my hands are full, i have a Canon SD1000 point and shoot (super old) as well as a phone camera with terrible resolution. When i do have time to chill out, my blog roll consists of Cup of Jo, Apartment Baby, Loquacious Family, Nat the Fat Rat and Definitely Raining! Check out my feature as the Mumfection Mom of the Week! congratulations Mitzi...can't wait to meet you at Glam! thank you and see you on the 19th! Congrats! What a fabulous win. Coming from last years runner-up, I can tell you that good things are about to happen. GET READY! Thanks so much for opening my eyes to malleries.com. JEEZE this is going to be a dangerous friendship ours! Big congrats to you Mitzi! Baby Portrait Vancouver :- Our top priority is to provide you with an amazing experience and make sure you walk away with one-of-a-kind Baby Portraits Vancouver, Beautiful Maternity Photography Surrey and Best Baby Photographers North Vancouver.